Empathy statements: definite or clear expressions of your ability to understand and share the feelings of another person, in speech or in writing. In a live chat session, it’s not always easy to convey empathy or understanding of a customer’s situation. Sometimes trying to show understanding can come across as pity, other times your responses sound robotic. Neither makes for the empathetic support that 40% of customers want more of when interacting with businesses. Enter empathy statements. Empathy statements are your way of conveying to a customer that you understand the concerns, issues and feelings they’re coming to you with. They demonstrate that you’re invested in solving the problem, answering their questions, and giving them a great experience. By using empathy statements in your live chat sessions, you build trust in each chatting customer and add the human touch to your digital service. So, here’s a handy list of empathy statements to get you started on the road to better live chat service. You can’t fully empathise with a customer unless you understand their problem. So, start by using empathy statements to clarify the customer’s chat messages and ensure that you’re both on the same page. By using ‘I’, you personally involve yourself in the support process. This personal approach demonstrates a willingness to identify with the customer’s problems and build a relationship – right from the off. This empathy statement explicitly tells the customer that you’re putting yourself in their shoes. It requires you to identify the emotions of your chatting customer. Here, ‘X’ could stand for ‘frustrated’, ‘upset’, ‘confused’ or even ‘surprised’. By confirming that you would feel the same way, you create a sense of accord. It not only shows empathy for the customer’s plight, but also assures them that their feelings are understandable. Empathy statements are a great way to validate a customer’s point of view. Validating a customer’s feelings about a situation can be as simple as confirming that they are right about there being a problem. Telling a customer when they are right about an issue helps customers see you as ‘on their side’. They feel understood, and recognise that you’re listening and fixing what has upset them. Saying you’re sorry isn’t the same as admitting you’re wrong. Apologising when a customer has been upset is a great way to start mending the relationship, and demonstrates that you understand that they have been made to feel negatively about your business. However, merely typing a canned apology doesn’t suggest an active approach to the problem. You have to genuinely mean it. So, the word ‘sorry’ alone isn’t enough for effective empathy statements — you need to make an effort to prove it to the customer. Empathy is about (figuratively) walking a mile in someone else’s shoes. 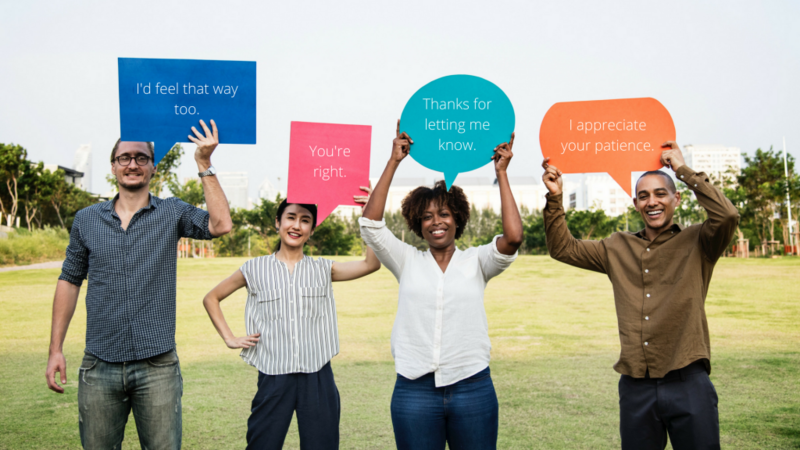 Empathy statements that demonstrate experience in the situation help you create a stronger connection with the customer. You’re explicitly telling them that you’ve walked that mile, and can draw understanding from your own experiences. This has some major effects. You validate the customer’s concerns by confirming that this is an issue others have experienced, you demonstrate that you understand the situation entirely, and you make a stronger connection because of it. Effective empathy statements can also be those that show appreciation for the customer’s contact. Your chatting customer has made an effort to speak to you and work out their issues. When you thank your customer for getting in touch, you are recognising and empathising with the effort they’ve made. You respect their time to boot. Saying thank you for reaching out is always positive. But you can also use appreciative empathy statements across the rest of your chat session, too. Perhaps the customer has been patient with you, given you useful feedback, or been empathetic to your position, for example. In these instances, you should always let the customer know that you’re grateful for their attitude or effort. Recognising extra effort – and showing your appreciation – is a great way to leave the customer feeling valued. To make effective empathy statements, you need to channel the cornerstones of empathy in a chat session: clarification, validation, reassurance and appreciation. Most importantly, you need authenticity. All empathy statements require authenticity to be effective. It’s not enough to parrot the same empathy statements to customers without any consideration for the way they’re actually feeling, or appreciation for the problems they’re facing. Why not put your newfound knowledge of empathy statements to use with a 30-day free trial of WhosOn?